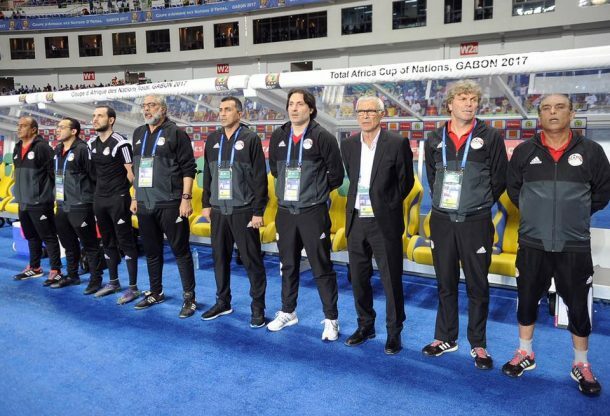 Egypt head coach Héctor Cúper has revealed his 24-man squad for the Pharaohs upcoming training camp ahead of Togo friendly which included Mahmoud Gennesh. The camp will start on March 22 until March 28 in Alexandria, as the 2017 African Cup of Nations runner ups get ready to face Togo in a friendly match on the last day of the camp as announced by the Egyptian Football Association. The Argentinian coach called up 10 international players to join the camp. He decided to include Wigan’s Sam Morsy, injured Arsenal midfielder Elneny, and the inform PAOK playmaker Amr Warda. Defenders: Ahmed Fathi (Al Ahly), Ahmed Elmohamady (Hull City – England), Mohamed Abdel-Shafy (Al-Ahli – KSA), Karim Hafez (Lens – France), Ahmed Hegazy (Al Ahly), Saad Samir (Al Ahly), Ali Gabr (Zamalek), Amr Tarek (ENPPI). Midfielders: Mohamed Elneny (Arsenal – England), Tarek Hamed (Zamalek), Abdallah El-Said (Al Ahly), Amr Warda (PAOK – Greece), Ramadan Sobhi (Stoke City – England), Mahmoud Hassan ‘Trezeguet’ (Royal Mouscron – Belgium), Sam Morsy (Wigan Athletic – England), Alexander Jakobsen (Viborg FF – Denmark), Mostafa Fathi (Zamalek), Mahmoud Abdel-Moneim ‘Kahraba’ (Al-Ittihad-KSA), Ahmed El-Sheikh (Misr El-Maqassa). Forwards: Mohamed Salah (AS Roma – Italy), Amr Gamal (Al Ahly), Arafa El-Sayed (Wadi Degla).